The Housatonic Valley Association (HVA) is seeking applications for our River Steward of Tomorrow Watershed Conservation Internship position, available for summer 2019. Based in HVA’s Stockbridge, Massachusetts’ office, the River Steward will work on a variety of projects related to water resource management and protection. The River Steward position lasts a minimum of 8 weeks from June – August (approximately 35 hours/week). Road-Stream Crossing Assessments in the Berkshires: River Steward will visit and assess bridges and culverts (using the North Atlantic Aquatic Connectivity Collaborative protocol) throughout towns in the Massachusetts portion of the watershed to identify barriers to fish and wildlife passage, and assist with post-assessment data management and processing. 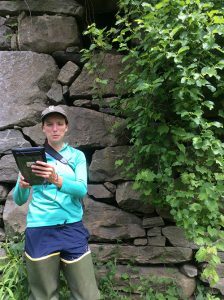 Stream Reach Assessments: The River Steward will assist HVA staff in the field to conduct visual surveys (“streamwalks”) along important stream reaches to document threats and identify restoration opportunities. River Steward will assist in post-assessment data management and processing. Environmental Monitoring: The River Steward will conduct water quality monitoring and habitat assessment activities including collecting water samples for chemical analysis and bacteria-source tracking. Restoration project monitoring and maintenance: The River Steward will assist with riparian and aquatic restoration projects and conduct maintenance activities such as invasive species removal, rain garden maintenance and assist with a riparian planting project in Great Barrington. Assist with public events including paddle trips, river cleanups and outreach events on an as needed basis. Experience using GPS and GIS is helpful, but not essential. Daily access to a reliable personal vehicle is a requirement of the position (HVA does not have a field vehicle, so all field work will be done in personal cars with mileage reimbursements.) The intern must also be physically able to participate in potentially strenuous field work (i.e., physically active work outside for several hours at a time during the heat of the summer). The intern will receive a $2,400 stipend for the course of the internship. Work related travel is compensated at a rate of $0.48/mile. Housing is not provided. Successful applicants will be responsible for locating housing. We will assist as much as we are able. Applications to be received by March 15, 2019.